French is the city's official language and is the language spoken at home, by over 50% of the population of the city, followed by English and other languages making Montreal one of the most bilingual cities in Quebec and Canada. Montreal was named a UNESCO City of Design. Historically the commercial capital of Canada, it was surpassed in population and economic strength by Toronto in the 1970s. It remains an important centre of commerce, education, aeropace, finance, pharmaceuticals, technology, design, culture, tourism, gaming, film and world affairs. Montréal is a very photogenic city: its architectural and natural beauty gives endless inspiration to both amateur and professional photographers. Here are some spots where you can snap truly iconic pictures of the city. Mount Royal Park - The Kondiaronk Belvedere and Mont-Royal Chalet is where you’ll find the famous skyline shot, with a view stretching miles beyond the St. Lawrence River. Old Port - Stroll along the historic buildings, the cubist Habitat 67, Silo #5, and the elegant Clock Tower. Olympic Stadium - A ride up the Olympic Park’s Tower will bring you to a breathtaking 360° view of the city. Parc de la Cité-du-Havre - This is the absolute best place for a full-frontal shot of Montréal’s skyline and for up-close photos of Habitat 67. Streets of the Mile End and Plateau Mont-Royal - Photography highlights include the bagel shops on Saint-Viateur and Fairmount Streets, countless churches, street art, colourful houses and of course the typical staircases. The Botanical Garden sports a remarkable array of colourful plants in its outdoor gardens and greenhouses. St. Joseph’s Oratory - Capture the architectural beauty of this pilgrimage site against the greenery of Mount Royal. Parc Jean-Drapeau is covered in public art and beautiful buildings such as the Biosphere, and is another place to get a great angle of Montréal’s skyline. For more information about Montréal and to learn more about the Muslim community, please click the above links. In Montreal, the first influx of Arabs (Muslims and Christians) from the Middle East occurred after the end of the First World War (1919-20). Most of these Arabs spoke French (as a second language) and thus found it easier to settle in Quebec. Mr. Masoud, who owned Masoud Realty Company, hailed from Lebanon, arrived in Montreal in the mid-twenties. The beginnings of Muslim immigration from India and Pakistan could be traced to the mid 1950s. Habibullah Khan with his wife and five children arrived in Montreal in 1955. They took up residence in Verdun. There were also, at that time, a few Muslim students at McGill and the University of Montreal. Habibullah Khan was a Chartered Accountant from Britain. The Khans were very hospitable people and their home became a hub of social get-togethers. On the occasion of Eid or other religious holidays, Khan would invite Muslims living in Montreal to his home for dinner. The Institute of Islamic Studies, established in 1952 at McGill, attracted a number of Muslim students from various countries. Some of the early Eid gatherings for prayer and social gatherings took place at the Redpath Crescent (Institute of Islamic Studies) where the newly arrived Muslims congregated. The Institute of Islamic Studies (McGill) was fortunate to attract scholars of the calibre of late Dr. Fazlur Rahman (Ph.D. Cambridge), Ismail R. Farooqi (Ph.D. Minnesota) and Dr. M. Rasjidi (Ph.D. from Indonesia) at that time. Their presence in Montreal gave a big boost to the Islamic Centre of Montreal. During his term as the President of the Centre (1960-61), Dr. Farooqi developed good relations with the United Church in the Town of Mount Royal and the Muslim community was welcomed to hold their functions in the church. Mrs. Farooqi organised children's classes, which were held in the basement of the church every Sunday. About that time, there was an influx of medical graduates who arrived for training as specialists in various medical disciplines. Some of the wives accompanied them. Also a number of commerce graduates started coming to get training as accountants to obtain Chartered Accountant designation. In the late 1962, the Islamic Centre of Montreal rented an office on Sherbrooke Street West, not far from McGill main gate in order to give legitimacy to the organisation. It was a two-room space and was paid by the members of Muslim community. The Islamic Centre, besides arranging and holding Eid prayers, would arrange social gatherings and dinner on these occasions (catered by the Muslim families). One such festivity took place on St. Helen's Island, after Eid ul Adha prayer; Mr. Masoud made the ritual sacrifice of lambs, which was cooked on open fire (BBQ) and enjoyed by all present (more than 50 people). In addition, the Centre made efforts to arrange one meeting each month and invited local scholars to deliver talks on various aspects of Islam, followed by question and answer sessions and refreshments. In those early years, during the month of Ramadan, an Iftar party followed by Taraweh prayer would be held on Friday, Saturday and Sunday evenings, in rotation, at the homes of Muslim families and all known Muslim students would be invited. One of the prime objectives of the handful of Muslim brothers and sisters responsible for the initial formation and growth of the Islamic Centre was to construct a Mosque in Montreal. For this purpose a fund-raising compaign was therefore launched. Modest donations and proceeds from various functions such as Bazaars and Dinners helped in the accumulation of funds. The Centre had acquired the services of a lawyer, Mr. James Robb with Stikeman and Elliot for its incorporation. In the Province of Quebec, all marriages and births had to be registered in the church, as there was no civil registry. The Muslim community faced this problem, as the Islamic Centre of Montreal was not authorised to perform these functions. Mr. Robb advised the community that the problem could be solved if the Quebec Government would recognise Islam as a minority religion, which would require that a private bill be initiated by a member of the National Assembly and passed by the house. It was going to be expensive (lawyer's fees etc.). At the general body meeting, a resolution was passed, authorising the executive to proceed with this matter and seek the Government's recognition. The Liberal party was in power, with Hon. Jean Lesage as Premier of the Province. He had been a partner in the firm of Stikeman and Elliot before becoming Premier and was sympathetic to the idea. Mr. Robb arranged for a sponsor for the private bill (a sitting member of the Liberal Party). The name of the organisation was to be changed to the Islamic Centre of Quebec. This was done by a resolution at a meeting of the Islamic Centre of Montreal. So the wheels were set in motion and an application for an Act to incorporate Islamic Centre of Quebec-El Markaz Islami was made on behalf of Habibullah Khan, Muhammed Barker, Mumtaz Rehman, Ahmed Mohiuddin Khan, Mushtaq Ahmed, Sultan Akhter, Aziz Naek, Fazal Khan, Muzaffar Eqbal Keen, Kalimullah Khan, Mateen Qureshi, Mubarak Hosein, Hakim Ullah Khan Ghauri, M. Hosein, Sherrif Yervich, and Iftikhar Sheikh. On the day of the voting in the National Assembly, the following members of the association attended the session in Quebec City to answer any questions that might be raised: Habibullah Khan, Fazal Khan, Kalimullah Khan, A.M. Malik and Mumtaz Rehman. The Private Bill, Bill 194 was passed and received assent the 6th of August 1965. The Islamic Centre of Quebec (ICQ) was thus granted the rights of Civil Status. This was a momentous and historical step for the Muslim Community in and around Montreal. The recognition of Islam as a minority religion was a big milestone in the history and development of the Muslim community in Montreal. 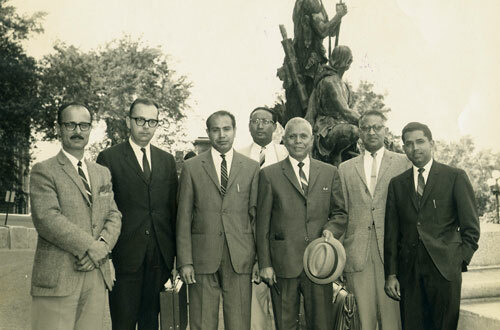 From left to right: Roohi Kurdi, Solicitor from Stikeman, Elliot, Mumtaz Rehman, Fazal Khan, Habibullah Khan, Kalimullah Khan, A. M. Malik in Quebec City to attend the National Assembly Session, August 1965 when Bill 194 was assented to. By 1971 the ever-increasing population of Muslims reached close to 5,000 and the facilities at 2520 Laval Road were stretched to its limits. Also the roof started to leak at some spots and the ceiling actually fell down in one of the two class rooms one Sunday morning. There was an urgent need for action. There was a possibility that the facilities could be expanded because there was land available at the site. During negotiations with the City of St. Laurent to obtain a building permit for the construction, it came to light that the existing building violated the bylaws of the city as to the clearances. The building permit could be given for an extension project only if a completely new building were to be erected; the area permitted for construction would be greatly reduced. In 1972, it obtained approval of the general membership to go ahead with the renovation and extension project. A team of brothers was organised to go door to door of Muslim households for the collection of funds. Some private sector corporations, such as Royal Bank of Canada and Steinbergs Ltd. made donations to the mosque fund. To continue the programs of ICQ and prayers during the construction phase, facilities at a local school in St. Laurent were rented from the School Board. Although ICQ had only $13,000 in the bank, a decision was made to start the construction. The work started one Friday morning in early August 1972 with an expected completion date of January 1973. As the construction proceeded, the collection of funds accelerated. It was a proud chapter in the history of ICQ to see the completion of the expanded facilities, all due to help from Allah and hard work of fund collection volunteers and the Construction Committee. It would be a great omission if the contribution of women of the community were not mentioned here. The ladies arranged bazaars, dinners and other functions to raise funds for the project. Moeen Ghauri, a Hafiz of the Quran was named Imam of the mosque and he served the community for a long time (more than 15 years). The current Imam is Syed Fida Bukhari. Just as the Montreal Muslim Community was growing in numbers, other cities-Ottawa, Toronto, Vancouver, Calgary, Edmonton, and Halifax-were experiencing a boom in Muslim population as well. Local organisations were springing up and Muslims were getting organised. A need was felt to organise them under the umbrella of one Association. The Council of Muslim Communities of Canada (CMCC) was born. Leading Muslims from various cities-some of the names which come to mind are Dr. Faud Sahin from Niagara Falls, Ontario; the late Muinuddin from Toronto; Qasim Mahmud from Ottawa, Ontario-attended a meeting held in Montreal at the Islamic Centre of Quebec. Mumtazul Haque Rehman was the Chairperson of this meeting. It was held in the summer of 1973 and Dr. Sahin, the late Muinuddin, Qasim Mahmud, S. Ali Husain and Bashir Hussain were authorised to compile the Constitution and Bylaws for the new CMCC with headquarters in Ottawa. S. Ali Husain and Bashir Hussain were from Montreal. CMCC flourished for a few years and had an office in Ottawa with a Secretary. It published a quarterly magazine. It was mainly funded by Saudi Arabia. Membership fee for local organisations to join was $25.00. CMCC was not a democratic organisation. The same people controlled and held on to the Executive from year to year, resulting in dissatisfaction. After 4 or 5 years, the funding dried up and the activities of the Association ceased. Today the Association exists only on paper without any activities. The Muslim Students Association (MSA): In the seventies there was a movement sweeping university campuses across North America, the MSA (Muslim Students Association), funded mainly by Saudi Arabia. Expansion of the MSA was viewed to be a good idea as long as it did not interfere in the working of local organisations. The MSA had a good deal of success, but it started to interfere with, and control the affairs of local organisations by imposing the policies of the fund donors. Tablighi Jamaat: This organisation originated in Pakistan. The constitution of this organisation requires the revival and propagation of Islam (Daawa) and it has been successful in attracting large number of people. They have been successful in the revival of Islam through preaching to Muslims. The mid and late seventies saw further increase in the numbers of Muslim Community in and around Montreal and visits by the Tablighi Jamaat from various parts of the world increased. ICQ had no problem with the visits of Tablighi Jamaat; as their worship and Daawa program contributed to uplifting of the community, but sleeping in the mosque hall was something else as it posed logistical issues. Even alternative sleeping arrangements for the visiting Jamaat were turned down. When all efforts failed, the Executive under Yuksel Oran, President in 1978, passed a resolution forbidding any body to sleep in the mosque. This resolution did not sit well with the members of the Tablighi Jamaat. Because their numbers had soared, there was a big uproar. Members of the Tablighi Jamaat never cared to become regular paid members of ICQ as they thought it was unnecessary. Now with the passage of this resolution, their Chief (Amir) organised the Jamaat and called upon the members to get the membership of ICQ, so that they could have a voice in the running of the ICQ. Some 80 new members were admitted to ICQ. At a Special General Meeting of ICQ held in the fall of 1978, a no-confidence motion against the Executive of Yuksel Oran was passed by the membership present. The moderates lost the vote as some disgruntled members sided with the Tablighi Jamaat. Oran was ousted as President and a new Executive elected. This was an important moment in the history of the Muslim Community in Montreal as it divided the community. In the past difference of opinions were amicably resolved, using the principles of Islamic Shura. The split in the membership caused by the above vote encouraged other Muslim Associations to be formed. The Muslim Community of Quebec (MCQ) was thus founded by moderate members of ICQ who were against the no-confidence vote. Dr. Mohammed Amin became the first President of MCQ. Many Arabs and other North African Muslim Arabs joined the MCQ. While nothing was happening at ICQ, MCQ was flourishing. Dr. Amin, a dedicated Muslim embarked on a very ambitious project and launched a school for Muslim children, from Kindergarten to elementary level. The school was recognised by the Ministry of Education and has grown to high school level. It has a very good record of student achievements in the Province. Due to the increasing population of Muslims in Montreal, all mosques in Montreal were experiencing overcrowding on Fridays. In the 1980s and 1990s, other Muslim organizations and mosques started functioning in different areas of Greater Montreal. During the 1980s, ICQ doubled in size by acquiring adjacent vacant land and building an extension to the existing facilities. Some land was used for parking. The new facilities included an expanded place for Wudu (ablution), more washrooms for both men and women, a place for bathing of the dead bodies and freezer for the storage of bodies before their burial. There were provisions for a large meeting room, a kitchen, an office, a library, and classrooms. A separate entrance for women was also provided. Expansion of the Muslim Community in and around Montreal continues; other mosques and Massallas continue to be added. It is estimated that there almost 250,000 Muslims living in Greater Montreal. A two-storey expansion of the Islamic Centre of Quebec is in the construction phase and nearing completion. In the South Shore, construction of a new mosque and community centre is going in full swing. The Canadian Islamic Center Al-Jamieh purchased a large property (formerly a Synagogue) on Anselm Lavigne Street in Dollard des Ormeaux, which is now the largest mosque in Montreal. I arrived at the Centre for noon prayers. There was an abundance of children all wearing traditional white robes, prayer caps and smiles. I was surrounded by a sea of adorableness.